I have come to believe that fee for service (FFS), at least in its current incarnation, is an unsustainable model of financing health care. Pick up any newspaper or journal and you are likely to see that I am not alone. The reasons are as numerous as the faults of the present health care landscape – high costs, poor quality of care, unhappy patients, and unhappy providers. In fairness, not all of the current mess can be laid at the feet of FFS, and there are some pretty attractive ideas out there about how to improve care and lower costs within a FFS framework. Most of these alternatives center on paying providers for episodes of care instead of specific elements of care. For instance, CMS has experimented with bundled payments that incorporate physician and hospital fees, as well as pre- and post-operative care for certain surgical procedures, and it is poised to do so again . Michael Porter has written extensively on how providers should be reimbursed based on the value of their services (defined as their quality divided by their cost) instead of the volume of services, as is typically the case now. A more radical approach is for providers to take on the role of insurers. The basic idea is to “go upstream” in the typical payment cascade of employers (or individuals) to insurers and insurers to providers. It is a classic strategy of disintermediation – cutting out the middle-man – with the promise of a bigger cut of the economic pie, which in this case is the pool of premium dollars. The strategy has the additional appeal of freeing providers from the controlling influence of payers on the delivery of care, and from the seemingly relentless reduction in FFS rates. It is actually an idea that has been around for a very long time, embodied in the old health cooperatives and in more contemporary examples such as UPMC and the Geisinger Clinic. That is the fundamental business motivation behind the creation of North Shore-LIJ CareConnect a wholly owned insurance company of our health system. The company is up and running, selling heath insurance on the New York State exchange and in the commercial market. It could simplify the lives of patients and providers alike, by eliminating the contentious relationship between payers and providers. I think it is a good bet. I am very interested to follow the progress. It seems to me that the key in the post fee-for-service world that we are heading toward will depend upon following evidenced-based practices and developing tools to measure quality (for episodes of care, or other units of time and disease). These will enable society to distribute limited resources most effectively. Rationing of health care – whether it is done by insurance companies such as BC/BS or Medicare/Medicaid – is already happening. NS-LIJ as an insurur will need to do the same. Will it be better for us to have to make these difficult decisions on our own? 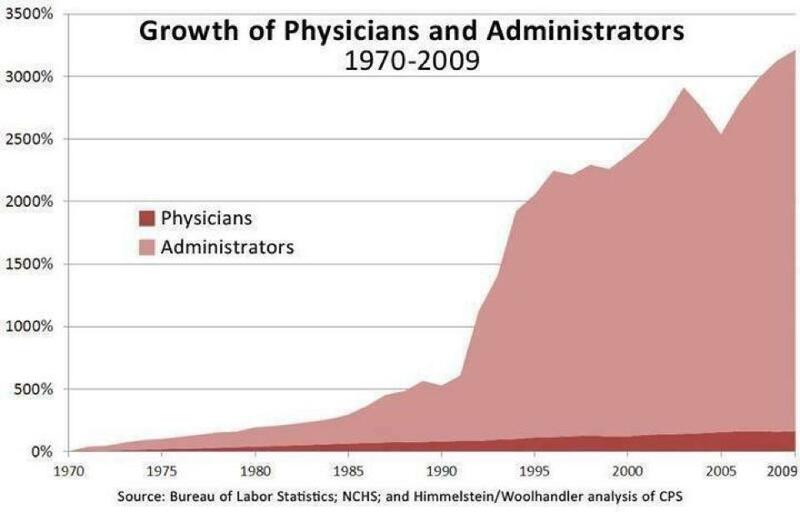 Want to see another reason why Healthcare costs have skyrocketed? Check out the graph at the link. Healthcare is the only business which claims it can save money by increasing the number of middlemen. Finally, the prospect of trading one conflict of interest for another conflict of interest should trouble everyone.